Irish Throw Blankets for every gift occasion. Gift shopping can be stressful at any time of year, not just Christmas. It’s stressful to think of the best Irish gift for anyone including your mum, dad, sister, brother, grandparents or your friends. The best gift is one that is truly special and outside the box, more than things they like. The best gift for someone is one that gives a feeling. Presents that give feelings of warmth, comfort and home. That’s the feeling of the Irish Throw Blanket. Loominations Irish Throw Blankets are the perfect give for any occasion. It’s the perfect for someone close to you who recently moved. It’s the perfect gift for someone to add style to a couch, a bed or their favourite sitting room chair. They make beautiful sofa and bed throws, adding colour to any room. Loominations Irish Throws also make the perfect gift for someone going back to school, for a university student. A Irish Throw Blanket is the best gift for someone who loves Ireland. But don’t forget grown-ups need the safe and security of an Irish Throw Blanket too! Loominations Irish Throw Blankets also make the unique his and her Irish gift. Our blankets make a wonderful present for the entire family. They are guaranteed to make anyone feel happy and put a smile on their face. Give a gift throw blanket from Ireland, it’s a warm and soft touch from the heart. The Irish Throw Blanket is a great gift for the Irish traveler. The blanket is a reminder of travels and memories of specific times, places and people from Ireland. The exclusively designed Throw blankets are the most unique gifts from Ireland. They are the perfect gift for every occasion, for everyone. All our Irish designed Throw Blankets are refreshingly warm yet breathable and provide comfort on winter days and during summer evenings. 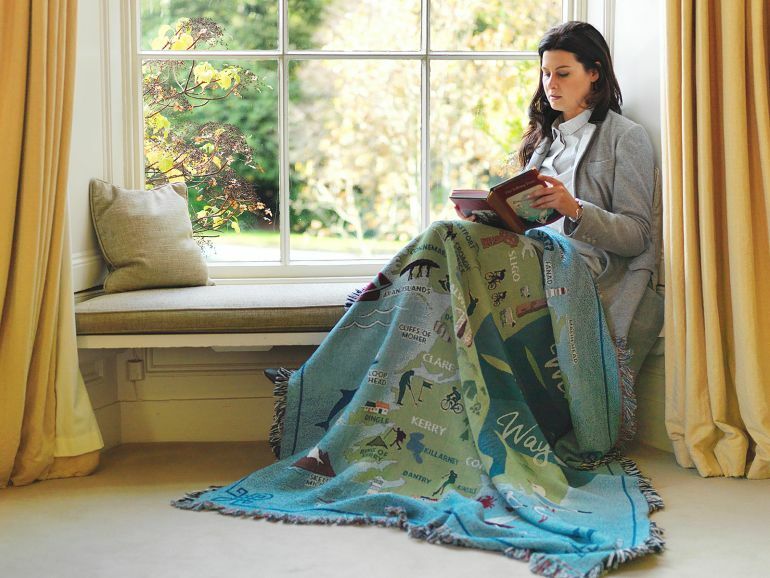 Whether relaxing by a fire, snuggled in the car during a long journey, or cosy curled up on your couch with a book, a Irish Throw Blanket will help you enjoy life’s perfect moments all year long. All Irish Throw Blankets from Loominations are made with 100% premium quality colour fast natural cotton and are machine washable and can be tumble dried for easy care. Loominations Irish Throws took care so you don’t have to. A truly premium gift from Ireland.